Kaila Nature Of The Work: Photographers take pictures of people, places, or things. They take the pictures to entertain people, report the news, or sell. 3 Nature Of The Work: Photographers take pictures of people, places, or things. They take the pictures to entertain people, report the news, or sell things. They use lights, lenses, and film to create the perfect photo. They also use computers to finish the picture, and make it look better. They can work up to 40 hours a week. 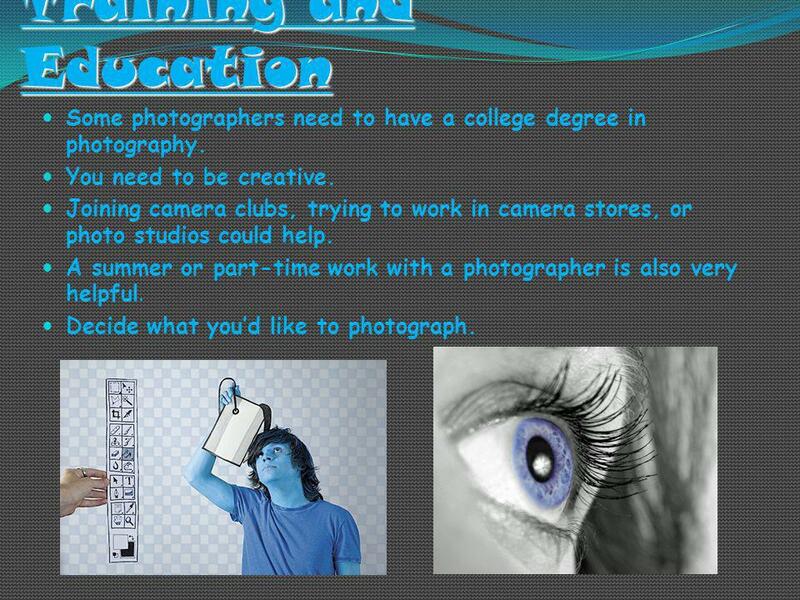 4 Training and Education Some photographers need to have a college degree in photography. You need to be creative. Joining camera clubs, trying to work in camera stores, or photo studios could help. 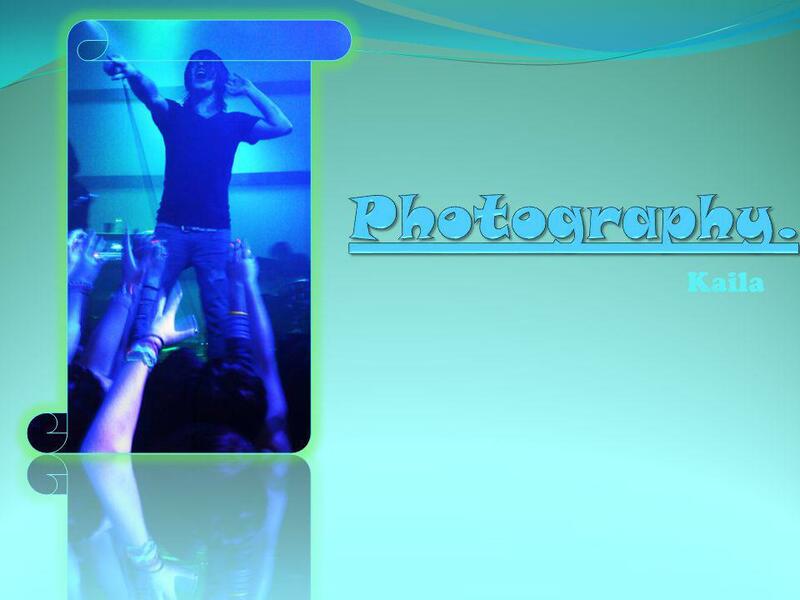 A summer or part-time work with a photographer is also very helpful. Decide what youd like to photograph. 5 Employment: Photographers held about 122,000 jobs in 2006. Most of them worked around large cities. More than 1 out of 2 were employed be themselves. Other photographers that work for somebody else, worked in a photography store. They even worked for newspapers or magazines. 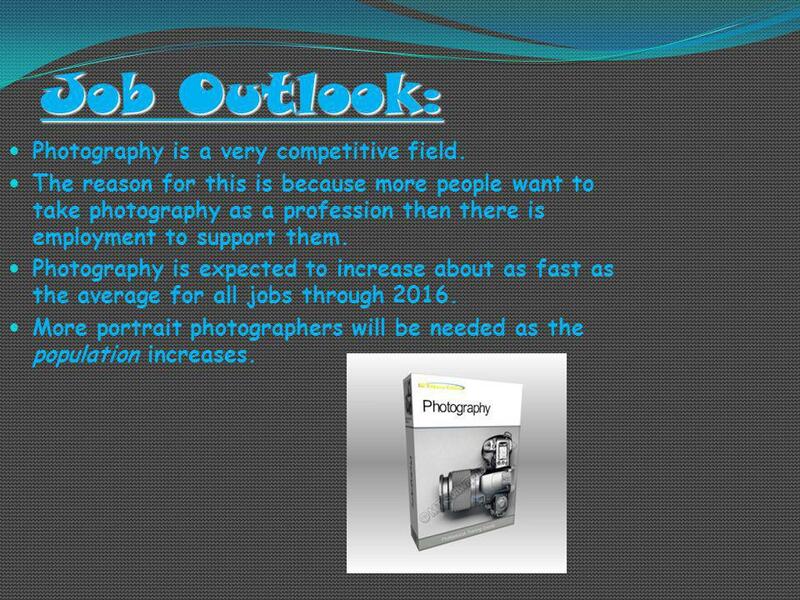 6 Job Outlook: Photography is a very competitive field. The reason for this is because more people want to take photography as a profession then there is employment to support them. Photography is expected to increase about as fast as the average for all jobs through 2016. More portrait photographers will be needed as the population increases. 7 Earnings: Median annual earnings of salaried photographers were $26,170 in May 2006. 50 percent earned between $18,680 and $38,730. Lowest 10 percent earned less than $15,540, and the highest 10 percent earned more than $56,640. Salaried photographers tend to earn more than those who are self employed. This is because most portrait photographers purchase their own equipment. 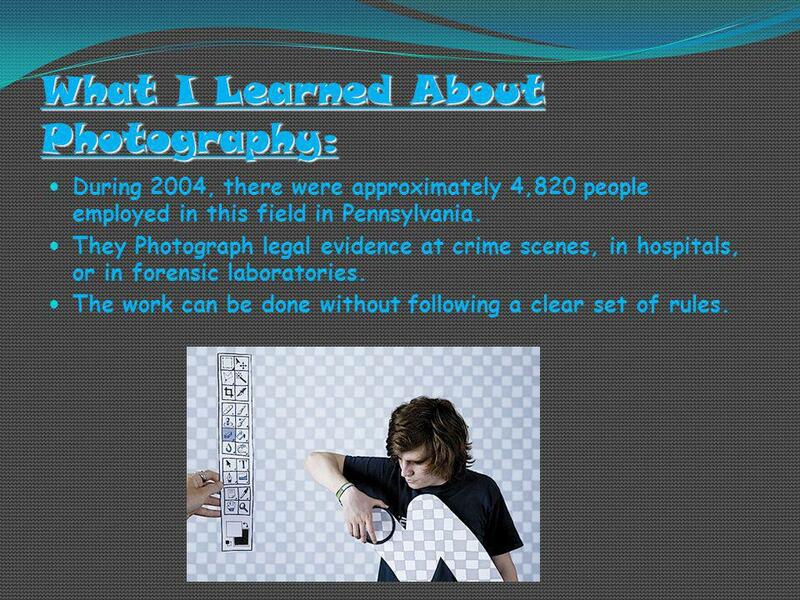 8 What I Learned About Photography: During 2004, there were approximately 4,820 people employed in this field in Pennsylvania. They Photograph legal evidence at crime scenes, in hospitals, or in forensic laboratories. The work can be done without following a clear set of rules. 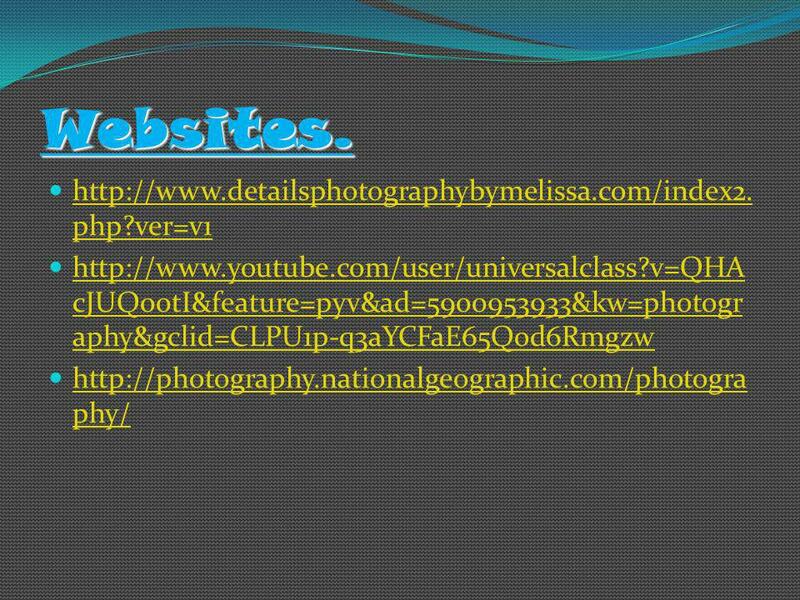 Download ppt "Kaila Nature Of The Work: Photographers take pictures of people, places, or things. They take the pictures to entertain people, report the news, or sell." About the Biotech Industry A North Carolina Biotechnology Center survey shows that 70% of biomanufacturing workers are trained at the Community College. Outliers. Do Now Bill Gates makes $100 thousand a year. He s in a room with 9 teachers, 4 of whom make $40k, 3 make $45k, and 2 make $55k a year. What. By Roger Yin Duty Software engineers research, design, develop, and test computer or computer-related equipment for commercial, industrial, military. Photography By Isabel Cajulis, Christine Yuen, Ravital Narkolayev, Fred Stark. Career Choice by Tasha Winther. may process personal exposed film. OverviewOverview – Preparation – Day in the Life – Earnings – Employment – Career Path Forecast – ResourcesPreparationDay in the LifeEarningsEmploymentCareer. Restaurant Manager Brooke & Tori. Training & Education Internships Real-life experience Training on the restaurants computer system Most have less than. Section 5.3: Inflation and the Consumer Price Index. Copyright 2007 Thomson South-Western Chapter 3 Income and Purchasing Power. Microstock Photography. What Am I Going Cover? I will be covering three main areas 1) What is Microstock Photography? 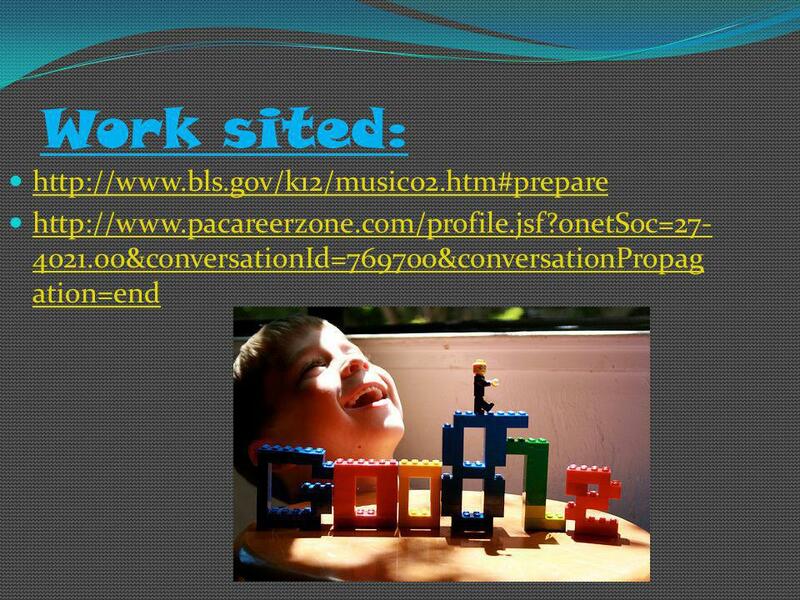 2) We will take a look at some of. My Future By: Brooke Faulconer. Jobs Volleyball Coach- teaches kids how to play sports. Volleyball Coach- teaches kids how to play sports. Waitress-Serves. The Role of the Corporate Event Planner Mary Julia Smith. 6 Weeks Test: Your Future Research Project. Purpose of this project: 1.Research a college/trade school/branch of the military/job that interests you 2.Gather. Real Estate DeAndre Fuller. Title of occupation Real Estate Agent.